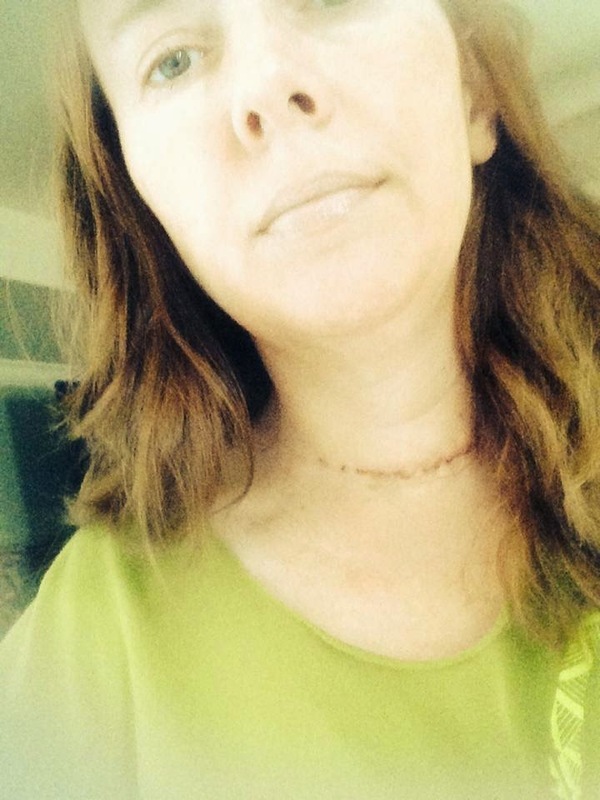 Today marks two weeks since my total thyroidectomy. The glue is mostly gone so the incision is looking a little better. I feel okay over all. I'm not quite myself yet, but I feel worlds better than I did last week. It seems I get tired easily, but I've been out and about and doing my normal housework. 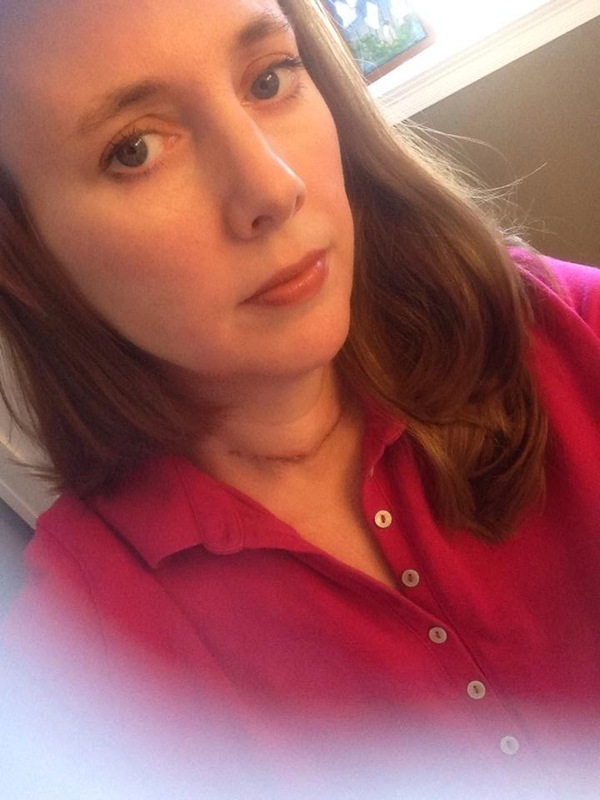 My incision feels tender to the touch and it pulls a bit when I move my head certain ways. Other than that bit of discomfort, I'm still surprised at how little pain there has been. Recovery from smart-lipo was ten times worse than this!! I'm planning to return to the gym on Monday and hoping to resume my regular workout routine. It's here!! Holidailies 2014 is open for registration! I would like to invite each and every one of you along for the ride. Won't you join us for a month of fun blogging?? 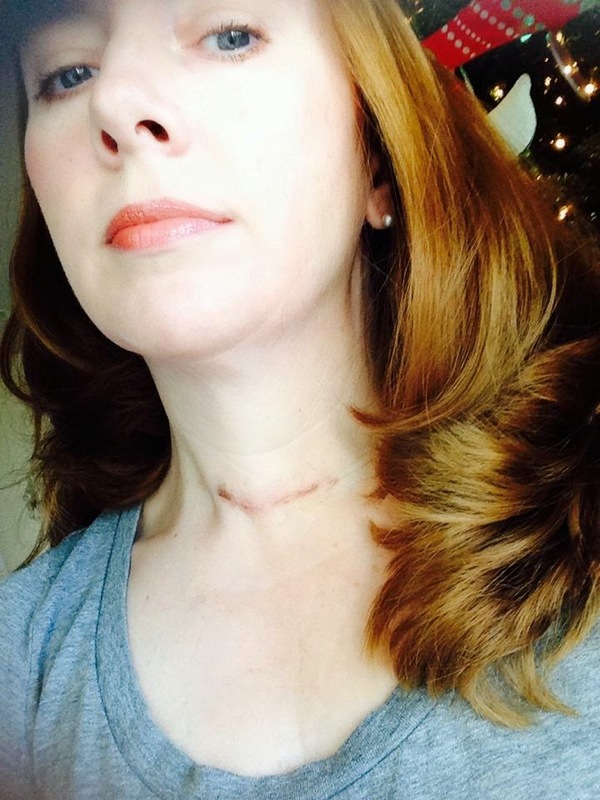 On November 14, 2014 I had a total Thyroidectomy. I had a 3cm nodule on the right side that continuously grew over the years. It was always the hope that it would shrink, but each year I'd have an ultrasound to find it had grown. I had a fine needle aspiration in October and it came back with atypical cells. We knew it would be abnormal, but atypical cells either meant thyroid disease or there was a slight chance of it being cancer. It was left up to me to decide if I wanted to watch it longer or take it out now. Taking it out seemed so extreme! The more I thought about it, the more it seemed that taking it out was the smarter choice. I knew leaving it alone would consume me with worry. With my family's medical history and all of the x-rays I was exposed to as a child, it didn't seem like something to play around with. Reluctantly, I scheduled the surgery. Pre-op was easy. I saw my family physician and he did blood work, urinalysis, and a chest x-ray. I met with the surgeon to go over the procedure and risks. I couldn't eat or drink after midnight, but I could take a Xanax and my Synthroid with a tiny sip of water in the morning. I was so nervous. Anxiety was just eating me up in the days prior to the surgery. I had to be at the hospital for 6:30am. They got me started on an IV. My doctor came in to see me and said he had a small 20 minute procedure first, then it would be my turn. We waited and waited. They made me take a pregnancy test (negative of course!) Finally just before 9am the anesthesia team walked in and introduced themselves. A big guy says to me. "I like you already!! I don't know you but I liked you before I met you!!" Huh? "I heard one of the first questions you asked was WHEN CAN YOU GO BACK TO THE GYM! That means you're healthy and I like healthy people." Haha, it was true. I asked about down time and asked how long before I could go back to the gym. It makes me wonder what was being said about me?!? LOL! I waved Clint over and someone said to say our goodbyes now. Clint gave me a peck on the lips and before I was wheeled out the room, the world went black. I remember opening my eyes and seeing lights. I cant say if it was before or after surgery or in recovery. I remember being moved from the table to a bed. A nurse was asking me my name. Someone was telling me to breathe into a mask. I heard the nurse call into the waiting area to let Clint know I was in recovery. I heard the nurse call in my stats to get my room ready. I think they asked me about my pain level - 4 or 5 I think I said. There were people around and they kept talking to me, but I don't remember what they said. After a little while, a man moved me to my room. Clint met us in the hallway. I had been gone for about 5 hours. The actual surgery took about 3 hours. I was hooked up to a morphine pump and they said I could push the button ever 12 minutes. Push I did! I wasn't in a lot of pain, but I didn't want to wait and see. I had a drain bulb on the right side, and that hurt more than the actual incision. I think the doctor came in to talk to me and said everything went great. Calcium held steady. Parathyroids were intact. He didn't see anything bad or anything that looked like a tumor. Nurses were in and out. My voice... I was surprised how well I sounded!! Just a little weak but I had my voice!! After I got settled, the roller coaster began - literally. Every time I moved, the room would spin. I shifted in bed, and the room would shift with me. I got up to pee, and couldn't stand on my own. By the time I'd get back to bed, I'd be on the verge of vomiting from the dizziness. I'd lay very still on my back until the world settled down. I tried to rest, but you know how it is in a hospital. The nurses keep coming in. All night long. Sometimes they'd just walk in, look at me, and walk out! They'd come and draw blood. Check vitals. The man next to me was hard of hearing and I could hear him having LOUD, long, drawn our conversations.... at 2:30am. Clint's snoring. I know all of this in and out is to care for you after surgery, but it also makes it very hard to rest. The next day, Saturday,.... oh I felt just awful. My voice completely quit on me so I couldn't speak above a whisper. The dizziness was still very bad. During the night I decided to hold off on pushing the morphine button to see if that would help. It didn't. Surprisingly the pain wasn't bad though. It hurt a but to swallow but I didn't have a sore throat at all. Feeling as bad as I did, I was still discharged. All my vitals and blood work were perfect. Calcium held steady at 9 the whole time. My doctor came in and removed the drain and gave me discharge instructions. I felt so bad I wondered how I'd even sit it in a wheelchair or in the truck to drive home. I made it somehow. I slept for twelve hours. Sunday, I woke up still dizzy, still feeling very off. By the afternoon, I felt very strange. My head ached and my legs felt tingly and twitchy. That was one of the 'seek medical care' warnings on my discharge papers. I was concerned that my calcium had dropped, so Clint called the emergency number, and was told to give me some Tums and go see my doctor in the morning. Later, the rash appeared. OH MY the rash. Something they prepped me with made me break out in awful, itching hives. From my shoulders, all across my chest.... red, angry bumps. Just awful!!! The doc sent me for a calcium check in the morning, and it thankfully came back normal. FIVE days post op: All clear... Pathology says NO CANCER! I just had a very inflamed Hashi diseased thyroid. Very thankful that nothing further is needed. I'm still very dizzy and light headed. It has to be an anesthesia hangover. I feel ok for a moment and the next I need to lay down. Can't wait to feel better. Now we wait. In six week we check thyroid levels to see if my meds need to be adjusted. Y'all know I LOVE to bake. Something comes out of my kitchen almost daily. I've been slacking lately because of the Halloween candy overload, but the holidays are just around the corner. It's BAKING SEASON!! I was given the chance to review some of the recipes in A Cookbook for ALL Seasons. THIS caught my eye immediately. Who doesn't like pecan pie.... with CHOCOLATE on it?!? I just might be making this very, very soon. This cornbread dressing would be PERFECT for Thanksgiving! Oh doughnuts! These would definitely fuel my love-hate relationship with doughnuts. I love to eat them but I don't like the time it takes to burn off the calories! Bacon everything seems to be a trend!! Bacon cinnamon rolls sound interesting enough that I wouldn't mind giving them a try! Veronica came home yesterday and told me she had a secret. 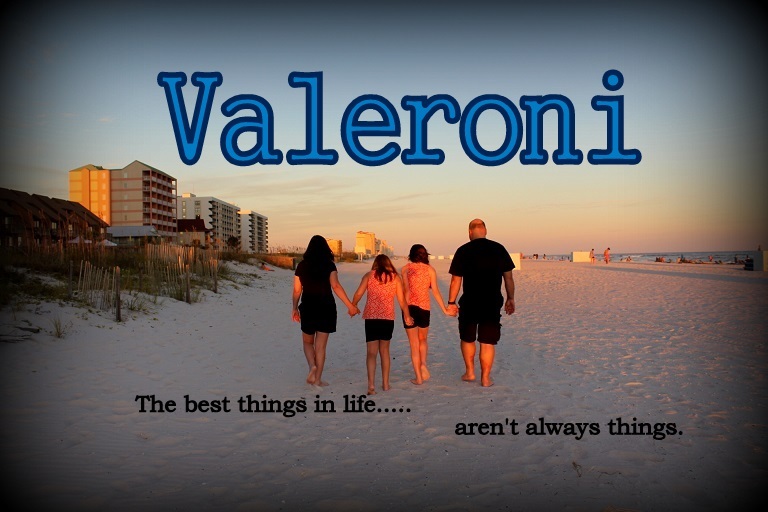 She made me promise not to tell Valerie because she didn't want Valerie to tease her. Ok I said, as we moved off to the side. Veronica cups her hands around my ear and whispers, "Me and Landon are in LOVE!" I gasp and said oh my! She said they decided it that afternoon. On the bus. He even wrote her a note that said I love you. Veronica continued on that maybe Landon would go over to the neighbor's house this weekend. (Both of my girls are staying over at a friend's house while I'm in the hospital.) "You know what that means," she said. And she puckers up and makes kissing noises. "We haven't kissed ..... yet." "You know what scares boys?" She puckers up her lips and makes kissing sounds. "They run away. I tried it last year at school and they ran away every time." Oh. My. Y'all she's only seven. We are so in for it. Well, formality wise, I'm all set for Friday. Pre-op went fine and I was cleared for surgery. I met with my surgeon this morning and did the pre-admit at the hospital. The nurse spoke to me as did someone from anesthesia. In other words, they are all ready for me. As for me.... well I'm ready for it to be over. Ready to begin healing. Anxiety and stress levels are high. Trying my best not to dwell on it. First of all, WHY do adults purposely scare the s#$% out of little kids?? I get that Halloween is spooky. Clint dressed as Jason with a bloody machete! He spent the night sitting at a table handing out candy. A few kids were too scared to approach him, but he would never pop out of a dark corner or chase anyone. Three times we had adults purposely scare Veronica. The worst was the evil creepy clown. When the clown noticed Veronica having a huge meltdown, he GOT UP and rushed TOWARD HER!! He then passed her up, turned around and stopped a few feet away. And just stood there. Staring. And Veronica screamed and cried and sobbed hysterically. Then he raised his mask, smiled, and walked away. And the chainsaw guy... with a real chainsaw chasing after people in his driveway. WTF is wrong with people!? Other than that, we had a great night!! A few friends joined us and we had a blast walking around the neighborhood in a big group. The kids got way too much candy. Then today, Clint hit the half price sale and we now have even more candy... hahaha!